I've seen a few nice archery bucks taken opening weekend and all it did was get me fired up for firearm season. Its going to be a long month and a half. Its being made even harder that I'm missing opening weekend again this year. My buddies and I are making a 4-5 day trip this year but can only swing it over second weekend with work and kids and all that stuff. Not sure how I'm going to make it. I can't believe that no one has replied to your question yet! I usually start making plans for the next years hunt as soon as this years has ended. My son made a nice discovery this year. We usually use google maps to look at our hunting country. But they are very slow to update. So he found updated material on bing maps, it has all the newest clear cuts shown beautifully. So we have been making plans on how to take advantage of all the new little bends and cuts in the land and little pockects that they left behind for us. We are heading up this weekend to poke around a little, make some trails, hang a couple stands, move some stands, clean up trails, and of course find some little camo chickens!!!! In a couple more weeks, I'll start twitching like a black lab in a duck blind! Labor day weekend was the only time we had available to do any scouting so we went up and did what we could. Its all public land so we didn't hang any stands but we did explore some nice ridge lines that over look a valley below that hugs a big swamp. The area is pretty hilly and the valley to a natural funnel and avenue around the swamp which is pretty wet. I hunted it last year a little and didn't see anything but I know they have to be there. Not alot of fresh since over labor day but last november there was quite a bit. Hopefully it pans out this year. I do have a few other spots picked out on the google maps that I'll fall back to if I have to. Although I didn't get time to scout them so I'll have to figure it out on the fly. any deer hunters looking for a new area to hunt. I have a area in mind that I have never seen a hunter in. Its state land and the one time I scoutted it I did jump a deer bedded down. I was up the deer country on the 22 & 23. Lots of sign, a couple small antler rubs, a bunch of ground scrapes already, put out the trail cam on 2 of them, and had way too many trees down!!!! There were big trees down from a west wind, and from an east wind, and sometimes they were on top of each other from 2 different directions, arg...that was a lot of work, and we only managed to get a few done of the many trails we have out there, it will take a couple seasons to fix the all of them! Slept in a tent and woke up Sunday morning to 22 degrees, glad I brought the cold weather bags! Bonus: My dad drew a wolf tag!!!!! Shoot a wolf and save some moose calves and whitetail fawns! Btw...there was wolf crap everywhere!!!! Hopefully we draw a couple more licenses in our group! We are hoping to get back up one more time in the next few weeks to do some more scouting. This is only the second time we've hunted this area so we have a lot of learning to do on this piece of land. Right now we are focusing on a ridge line that over looks two large swamps/bogs. The ridgeline goes along the swamps from the north to south with a nice valley at the base and then another small ridge right on the edge of the swamps. The valley bewtween the high ridge and small ridge is a natural funnel as is the spot between the two swamps. Haven't seen a ton of sign yet this fall in that area but I know there was a lot last november so we are expecting the area to see increased activity as we get into the fall. Right now its about a mile walk to this area without any sort of marked trail. That is one thing we want to remedy. Right now its a tough and noisy walk to get there with the climbing stand on my back. We want to get up there to clear as much of a trail as possible and also get the trail flagged. The challenge in scouting and trail making is 2 fold. Anytime that you can you should approach your stand sites from downwind. And secondly, understanding where the deer will be in early Nov. Remember, the deer will make the switch from grass and greens to a diet of browse in early Nov, so their habits will change from what they are today and then! That is very true. I certainly wouldn't bow hunt the area I'm looking at now since there is only minimal sign but that will change. I also still need to find more significant bedding areas. I've found a few small areas but nothing that has led me to want to set up adjacent to it yet. Approaching this area from downwind is the challenge. The only access is off a logging road and it can really only be approached from 2 different directions. I'm really hoping for a north or west wind during our 4 day hunting trip, ideally a NW wind will give use the best situation. If the wind is out of the east access is tough without getting winded, its doable but we have to detour further to the south and then set up in a slightly different spot. And even then we still are pretty limited in where we can set up and still have a reasonable shot of not being winded. You are right, making trails and maintaining them through swamps and bogs is not easy. But worth it in the long run if a trophy is your goal. 95% of all deer shot in MN are does and yearling bucks. And that's great if you are after meat. But one for the wall needs that extra effort. Tough trails like these get adopted by big deer and they make it a little easier to get the big boy. So consider it if you find some monster sign! 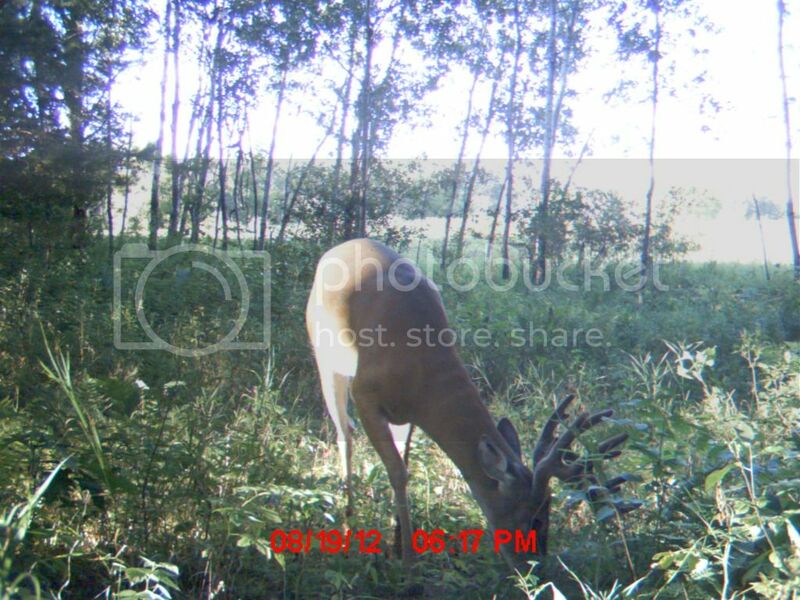 Here's a trailcam of a buck my buddy is bow hunting! If this doen't get you going, nothing will!